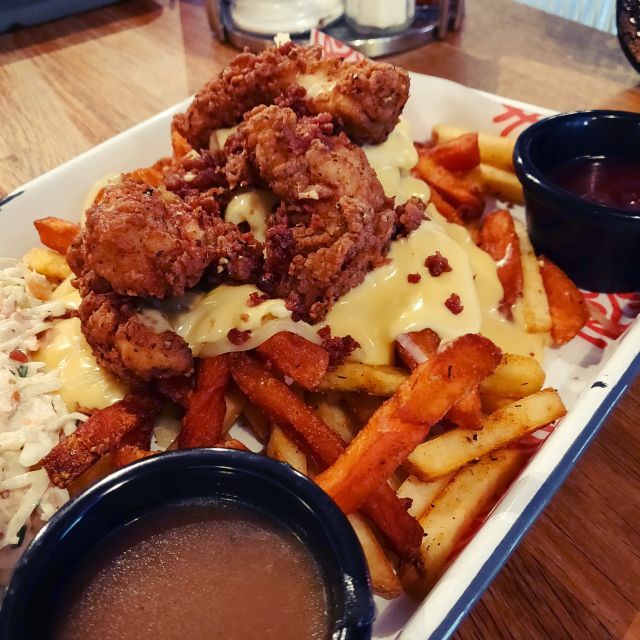 Generous helpings of comfort food and over-the-top indulgent treats to satisfy all your hearts cravings - toasties, tacos, eggs, bacon, waffles, fried chicken, steak, coffee, milkshake, cakes - Home Sweet Home is classic American dining with high quality, fresh ingredients. USUALLY A REALLY NICE PLACE TO GET A BREAKFAST BUT UNFORTUNATELY ON THIS OCCASION I COULD'NT EVEN EAT MINE. SERVICE WAS A LOT SLOWER THAN USUAL DESPITE IT BEING QUIET. Vegan meal was overpriced for the ingredients that were in it and the amount of food you got. Flatbread with cauliflower as the main ingredients totting up to £10....would have expected more. Meat meals didn't have a lot of meat in them, mainly all fries. Was ok but wouldn't eat there again. Take away cakes are delicious. Very well looked after, particular shout out for Joseph who sorted a delicious cake out at short notice. The food was good but the service was very slow. We waited nearly half an hour to pay with the plates on our table, just a bit annoying really. Lovely little spot for brunch in particularly (although they do run an evening menu with a bar licence). Range of food was perfect, from traditional English breakfasts to edgy unique offerings and also the more lean choices. We had to wait 15 minutes for our milkshakes which was a shame but the staff informed us of this at the time of ordering anyway. My only criticism would be that the sourdough toast could’ve been warmer and given it was only a two meal order, had expected better. Nevertheless, a cracking spot and will be back again. Long live the brunch. Went to home sweet home on Sunday 31st, mother’s Day at 3pm and I must say, the service was amazing, couldn’t fault it in any way. The waiter who was looking after us was really nice and made sure everything we got was great, I think his name was Ky. He was a really lovely guy, and it was one of the best experiences I’ve had when eating out. Would definitely be coming back and I would recommend home sweet home to anyone, Thankyou! Had one of the best eating out experiences here. The food was great but the best part of the experience was out waiter Ky. He was absolutely amazing, making sure that we felt welcome, had everything we needed and made great conversation! He is definitely one of the best waiters I’ve had in a long time! Great food. Staff were lovely and friendly. Food was quick, will definitely be back. From being seated at 6pm, when we had booked for (good start) it was 45 minutes until our starters arrived, then a further hour for our main courses. Whilst it was clear our waiter was doing his best the delay seemed to be elsewhere (the kitchen?). The restaurant was busy, but not full. It was disappointing to have to wait so long for our food, which was really nice when it arrived. sat down straight away- service a little slow and muddled but it was packed to the rafters, so it was understandable - wrong fries brought with one meal- exchanged immediately, with apology. all food piping hot. Took ages to get served. Food was ok, had the chicken and waffles. There was hardly any chicken, milk shakes were mediocre. Great server, the food was phenomenal. Will be going again hopefully. We visited HSH on a Saturday morning for breakfast. On arrival we order two soft drinks and a coffee. Considering there were only a few tables taken we waited 20 minute before asking where the drinks were. It took a fuether 10 minutes for tgem to arrive. We then ordered food and waited another 20 minutes for it to arrive. The staff were very friendly. The place was lovely and the food was nice. The only thing that came quickly to the table was the bill. Overall I would go back but would be chasing drinks and food after 15 minutes to avoid long wait times!! We were very impressed overall. Slightly slow service when it came to the drinks but it was explained by the waiter to be fair so cant really complain. A lovely afternoon tea with a varied selection of cakes and sandwiches - was a fun afternoon! 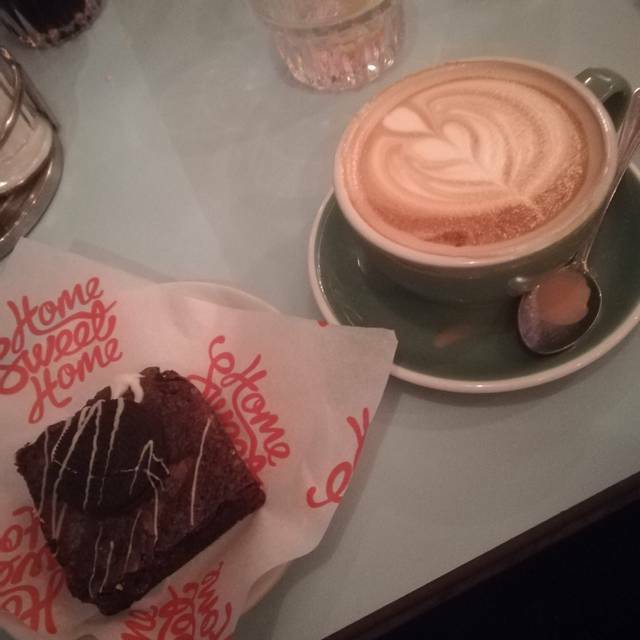 I went to home sweet home in the Northern Quarter. I was expecting great food and service. Food is average and menu options are limited. The service was great from some members of staff and very poor from others. The waitress was reading a book every time she could which kept her distracted and made the service very slow. I will not be coming back to have food as other places offer with similar concepts (american diner) with more food options and better service. The cake was great though. Lovely food, great service, amazing cakes/traybakes. Food was fine unfortunately service was not great. Waiter looked like he’d rather be anywhere else and anything we asked him was a massive inconvenience! Overall was ok. Service was a bit slow considering it wasn't busy. Drinks menu was limited for our group. Food was great but the service was really bad. We were in the secret room and twice where brought the wrong drinks. When the food arrived it took 15 minutes between the first plate and the last plate so most people had finished before all the food was delivered. 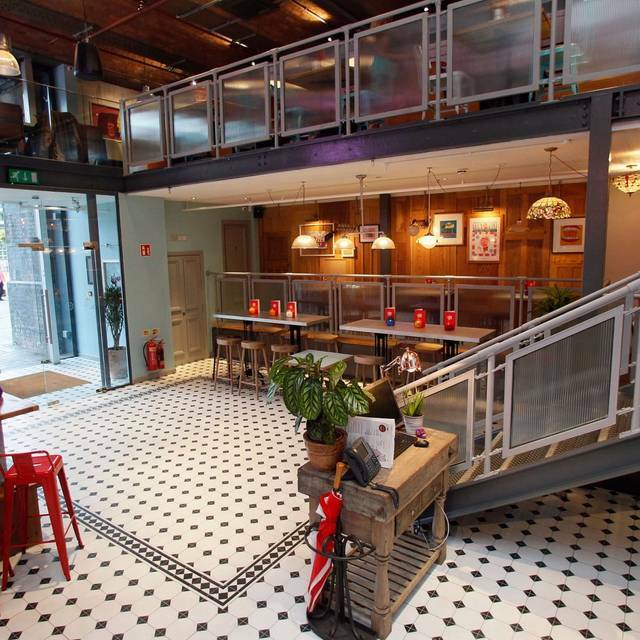 Great atmosphere, lovely food, definitely recommend...! Good value, unfortunately got our order wrong but corrected and our hot chicken were flavourless however everything else was good plus excellent cakes. Service was pretty bad - food was sat under the heat lamp for over five minutes and it wasn’t busy.. I had to tell the waiter that our food had been sat there for a long time and he just said if it isn’t warm, we’ll make it again. Two chefs just stood there talking over the food..
Have been many times and usually it’s alright, but overall it was very bad and was only made better by having 30% off. Table was booked for half 6, when served it took over 10 minutes each time a drink was ordered. We waited for over an hour for our mains and when enquired told it was another 15 minutes like we had been forgotten. Our main came at 8:05pm, one of our parties steak was stone cold and inedible, and due to delays over half the food was left as we had to leave so we could attend a show we were seeing at 8:30pm. Visited last week on the eve of my birthday. The restaurant was busy, but severely understaffed. Young lad pretty much running the place and rushed off his feet. I really, really felt for him. We ordered starters and mains but had to leave before receiving the mains, as we'd already been in well over an hour waiting for nacho starters and other tables had walked who had waited even longer. The server was really apologetic and would highly recommend him, but he was under too much pressure to man a large restaurant solely. Very friendly staff happy atmosphere,food was excellant very large portions had to get doggy bags home. We were a party of 5 including a 2 yr old and 9 month old who were made to feel welcome and ate off the kids menu food was fantastic and i will reccomend the chicken and waffles. Upon arrival we were told that there was no chicken. This eliminated 85% of the menu, still we stayed as I had been previously and had enjoyed my meal. I got the steak, which I was never asked how I would like it, it arrived pretty much still beating, I didn't want to say anything to the waitress as I have been in that role before and there is nothing worse than someone who whinge about their food. I ate the chips and replacement cheese fries as they had ran out of mac n cheese balls. 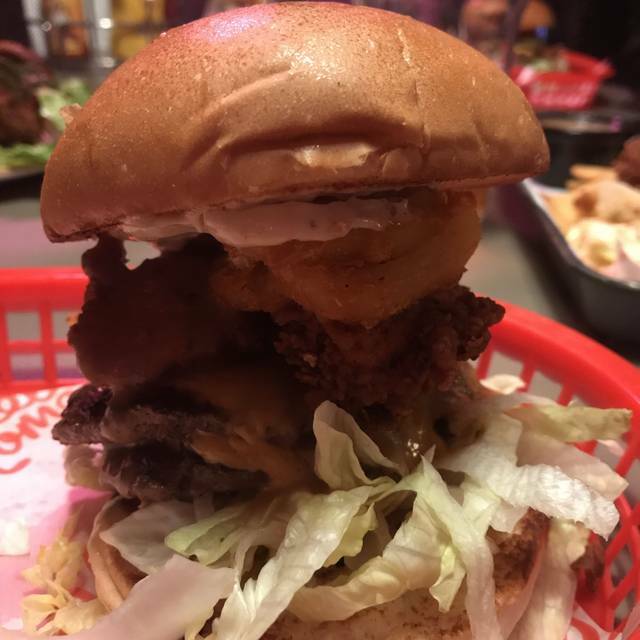 My partner had the burger which looked amazing, I wish I had chosen that now. After the food we asked for the cheque, waited about 20 minutes and then had to ask for it again as the waitress seemed to have forgotten us. This refunded me of the KFC fiasco when they ran out of chicken, I was gutted as I had raved about the basket of chicken all day. We were a bit early to our reservation, so we grabbed drinks at the bar. The service there was great and the cocktails were good! But, once we had gotten our table and tried to order, the kitchen was out of everything. Apparently, an order hadn't come in so over half of the menu was unavailable. We received our food and the nachos that were ordered didn't have all of the toppings that were listed on the menu. Overall, it wasn't terrible but I don't plan on returning. I have been several times and the food was always served warm , nice , juicy . But this time the burgers looked dry , didnt have much flavour , the cheese on our loaded fries looked abit dry and not melty/juicy . The waiter and everyhing else was great. Booked online, came early and was very well taken care of. Food was delicious and a great price, recommend the chicken cob sandwich and ultimate chicken and waffles. Overall awesome food and lovely staff! Food was average. Really enjoyed the fries but the burgers were disappointing. Was happy it had discount as i don’t think it’s worth the full price. The drinks were good value for money. The service was fast and friendly and we wasn’t checked if everything was okay too often which was good. The restaurant was clean and quiet. Overall was an enjoyable evening. Lovely naughty food. Not for people on diets as large portions.